1. Find truth in the Torah. Ask your rabbi to give a Dvar Torah (or write your own) about the tragic events of the past month and our responsibility as Jews to speak out and work to end homophobia and transphobia. Here’s a beautiful example from Rabbi David Mitchell, Radlett & Bushey Reform Synagogue, UK. 2. Speak out. The next time you hear someone say “That’s so gay,” tell that person why those words are hurtful and can have disastrous consequences. 3. Make your support visible. 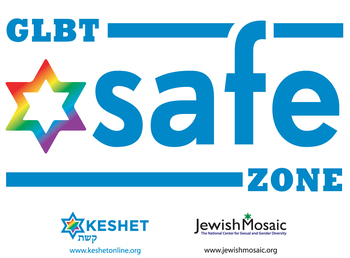 Post a Jewish GLBT Safe Zone sticker in your synagogue, classroom, camp bunk, office, or website. 4. Take action for equal rights. Contact your legislator to support ENDA, the Employment Non-Discrimination Act that prevents people from being fired or discriminated against at work for being gay, lesbian, bisexual, or transgender. 5. Keep youth safe and supported. If you are a Jewish educator or administrator at an educational institution, provide training and resources for your staff on how to create safe, inclusive spaces for GLBT and questioning youth. Help start a Gay-Straight Alliance. 6. Come out as an ally. October 11 is National Coming Out Day. If you are a straight Jewish community leader, let people know that you are an ally to GLBT people and keep the messages of support coming. 7. Come out. If you identify as gay, lesbian, bisexual, trans, and/or queer, come out and keep coming out. This simple act will help others. 8. Talk to your children. Middle and high school students witness homophobic and transphobic bullying and teasing every day. Tell your children you support them and that all kids deserve to be treated with respect and kindness. 9. Tell your story. Whether you are queer or a straight ally, upload a video to the It Gets Better Project and share your story with young people who need to hear your message. Visit the Make it Better Project to see powerful stories about what young queers and allies are doing right now to improve their schools and communities. 10. Seek support/give support. If you or someone you know is struggling with issues around sexual orientation and/or gender identity, know that you are not alone. Crisis support is available 24/7 through The Trevor Project, 1.866-4.U.TREVOR.